To start off, I will freely admit that while I dearly love most shoujo anime, Rayearth- at least the manga- isn't quite my cup of tea. (My favorite CLAMP manga/anime so far is actually Cardcaptor Sakura.) But still, I was very curious to see how this game was handled for the US market- especially since the English anime adaptation has only now been picked up. The game is packaged in the usual way-oversized packaging that US Saturn games come in, but there's a twist... the "Magic Knights Rayearth" logo, apparently the "official" English language logo certifed by Kodansha, is in prismatic inks, and the entire booklet is in full color- and features the same level of quality and detail that I've become used to in Japanese games for Saturn. No thin, photocopy-like, black-and-white substance here. It's amazing! The CD also has a full-color portrait of Fuu on it, too. The product overall is spectacular. There are even nicely done character stickers on the back flap. The game itself is the closest anyone who plays domestic Saturn games will every come to playing a translated anime game too! The game (apparently a very close adaptation of the original Japanese game) is full of cutscenes from the Rayearth anime, and has some very high-quality dubbed voice-acting as well. The spoken dialogue is typed out in a perfect English translation, at the proper pace and with animated "talking heads" of the speaking character, including facial expressions, etc. 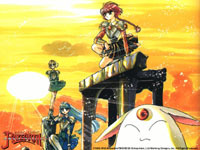 According to the liner notes, the game took 3 years because of licensing headaches, a language barrier, and English character name approvals with Kodansha, and also it appears that a lot of the original Japanese Rayearth game's code was trashed on the original developer's hard drive and it needed to be reconstructed. Even so, as is often the case in Japan to US adaptations, the original OP theme music could not be successfully licensed and thus there's a new English language theme. Still, it fits the OP animation quite well and carries over the spirit of the original OP theme. The story, of three young 14-year-olds spirited off from our world to the magical land of Cefiro to help an imprisoned princess and save their world from the evil Master Zagat is told in proper sequence and follows the anime story. All the typical CLAMP conventions appear, including the abrupt transitions from "standard" to "SD" characters at various times. The tale is typical "good vs evil" as in most shoujo "magical girl" anime/manga, and will certainly strike a chord with Sailor Moon and Ririka fans as well as those into sword-sorcery fantasy. As far as the game goes, the sprite and background artwork is sharp as a tack and beautiful. Original sound effects appear to have been retained, including Japanese attack cries in the game play itself (though they are properly translated in the dubbed clips). It moves along just like many anime games, and is more like watching a movie than playing a game at times... the sprite-based quest battle scenes have employed relatively simple weapon combat and nothing (ray)earth shattering . Dialogue box text is crisp and clean, nicely translated and smoothly delivered, and as with even Sakura Taisen, some text is just typed at times and not spoken. Overall, though, it's quite excellent so far (Sarah and I just got the Escudo back to Precia and got the new weapons, then moved on). Musical score is terrific, and appears to be the original. There are a few negative things that should be mentioned, though. Load time, though not critical, is long, and the game screen goes black during the loading intervals between cutscenes and game, or game scene changes, without a "Now Loading" screen to fill the time and assure the player that things are OK. Game play isn't that sophisticated, but it's still very relaxed for an RPG. Voice acting is fairly well done, though I flinch every time I hear the dub character say her name as "Hick-KA-ru" (as opposed to the equal stress "Hi-ka-ru"). On the other hand, "Umi" and "Fuu" are OK, as are other voices. Plus, I almost wish that Working Designs had gotten to keep their own English Rayearth logo, because it's spectacularly and brilliantly done, and style-wise, is almost exactly like the original Japanese logo. The (apparently) official English logo is OK, and at least keeps Hikaru's sword. If you're a fan of Rayearth, you'll love this adaptation of the Japanese game. If you've been content to play domestic Saturn games and afraid to get a Japanese "anime game" for fear of the language barrier, then this one will please you no end, as it has the same identical interface structure and format and will let you finally enjoy an anime game from all aspects- including language. Frankly, I'm quite surprised and pleased with this game, and don't hesitate to recommend it to any anime fan (and shoujo anime fan especially) who has a Saturn. Sarah loves it, and I had to forcibly drag her away from it after almost 2 hours of continuous play... which itself should be a good recommendation for it . The liner notes say "Rayearth" may be the last domestic game ever released for the Saturn. If so, then I can honestly say that the Saturn will go out with a bang instead of a whimper. Definitely, check "Rayearth" out.